Stories of young British soldiers headed into the World War I battlefront are brought to life in vivid, descriptive detail in this neatly-wrapped documentary. 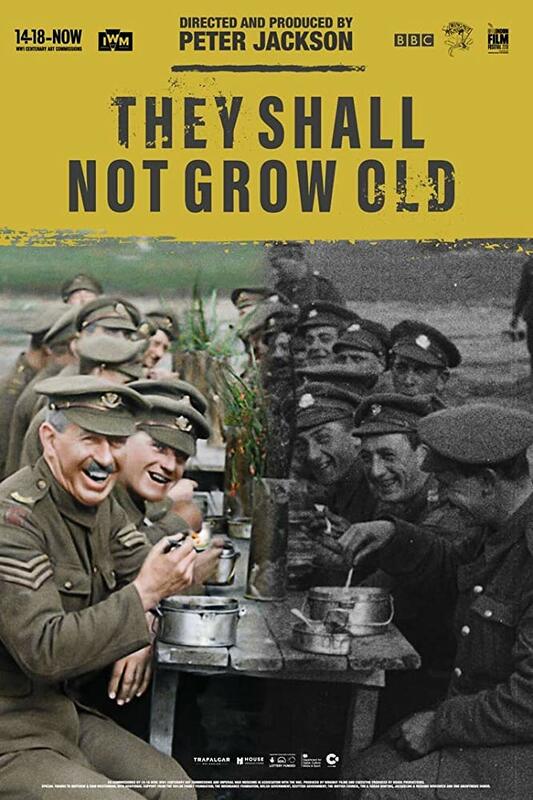 Using only narratives voiced by the men themselves, against a backdrop of wartime recruitment posters and cartoon commentaries of the time, as well as revitalized, authentic footage, “They Shall Not Grow Old” takes viewers on a journey from the first inklings of war rumors, the subsequent soldier recruitment and training, right to the forefront of the fighting and the inevitably grisly aftermath. It’s a truly haunting, humbling experience, watching these bright-eyed, hopeful boys as they sign up and settle into training — many of them well under the required age of 19, but who lied for the opportunity to fight for their country. 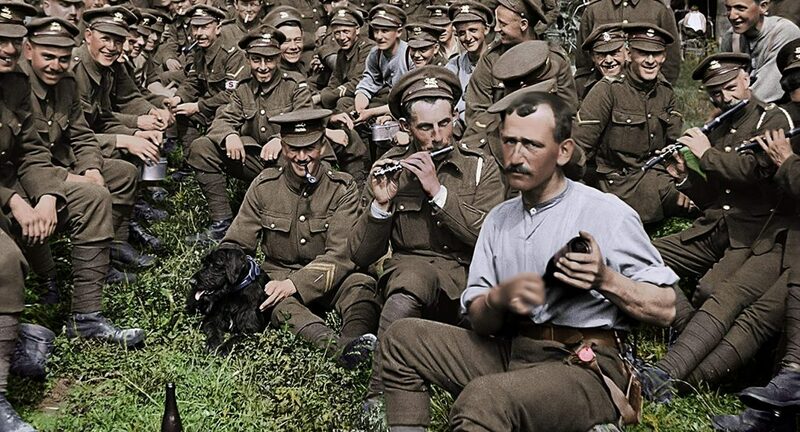 By 1914 when the war started more than 700,000 men had enlisted; throughout the war, that rose to roughly 5 million. More than 1 million of them died before the war’s end in 1918. 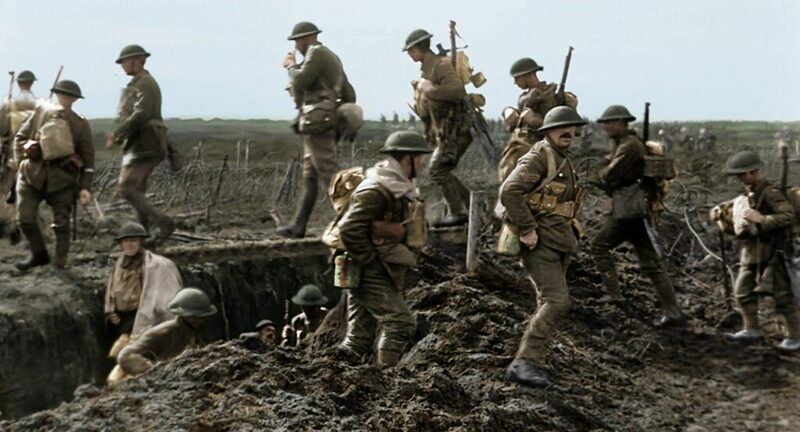 The colorized fighting scenes are both breathtaking and heart-stopping, and threaded with real-time battleground audiovisuals: the sharp cracks of shells zipping through the dust, the deep BOOM of canon fire, the rumble of tanks ambling over the trenches, the shouts of the men, the screams of the wounded. WARNING: This is a loud movie, and a gory one, that features, right along with fascinating strings of personal wartime narratives, a sizable amount of blood, open wounds, lice, rats, gangrene and dismembered corpses. The fascination, though, is in all of the little details. Although these scenes happened just a century ago, men are often heading into battle on horseback; the canons have wooden spoked wheels; the locomotives that transport troops and equipment are right out of snowy Christmastime England. The effect of the incessant assault of voices describing their experiences overtop the extreme visuals creates a captivating blend of the soldiers’ joviality, wonder and fear smacked up against the grotesque realities of war. Watch as the camera pans slowly over a group of men’s untroubled faces to a background of the soldiers telling their horrific killing tales. Listen as the soldiers recount, somehow with humor, how their comrades died in the fight, while onscreen are scenes of benign daily military life. At every turn, gaiety is twisted up with gruesomeness, celebration is contorted with savagery, merriment is stabbed through with the macabre. There are no actors. The soldiers speaking out for their stories are anonymous. But there is a long list by name, rank and branch of service of every British and Empire soldier featured in the at the film’s end. Wait this out and you’re treated to an additional half-hour with the director detailing the detailing the difficulties and delights of making this film. Quick Review: “Great History Is Brought to Life.” Although it’s a compilation of British war stories, every single American should see this film and appreciate the military service members who fought for the privileges we have today. These boys could be your sons, your nephews, your neighbors, your students. These boys could be your grandfather, your uncle, the grandfather of your local shop owner, farmer, or fireman. This is not a whitewashed Hollywood reel; “They Shall Not Grow Old” is as true a tale as has ever been written, a fine and multi-sensory wartime experience that exposes both the endeavor’s grandeur and unspeakable horrors. And in the voices of the age-old soldiers who survived, you feel a multilayered reverence for this time that could only be described by those who lived it.